Breast pain is the term used to describe a disorder characterized by aching, tightness, soreness, discomfort, or tenderness in one or both of the breasts. 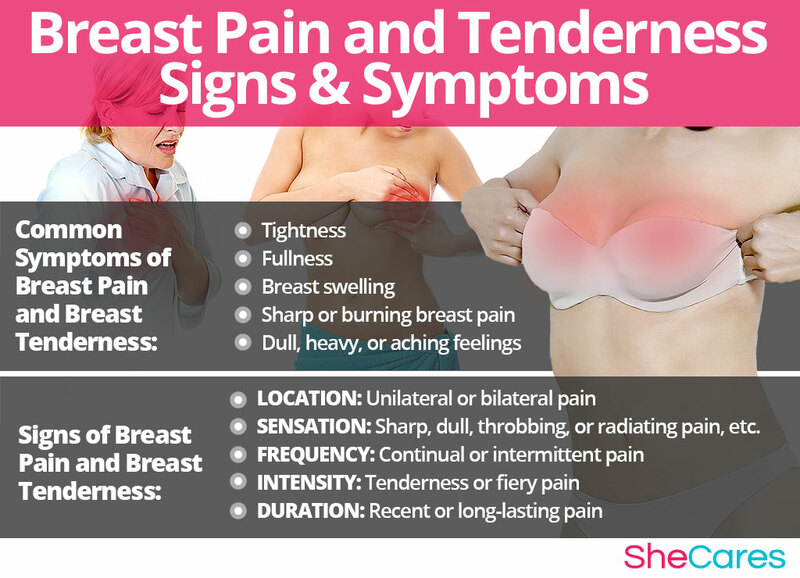 Breast pain is often accompanied by swelling, which may make wearing a bra or receiving a hug feel very uncomfortable. Most cases of breast pain symptoms are a result of hormonal changes in the body, and can occur at any age. It is important to learn all about breast pain in order to manage or treat the condition. Continue reading to learn more about breast pain and its causes, signs and symptoms, and treatment options, among others. Around 50% of women have consulted a doctor about breast pain or breast tenderness. Around 10-20% of women experience severe mastalgia lasting over a week per month. Between 16-32% of women suffer from breast pain when taking oral therapies containing estrogen. Breast pain, also known as mastalgia, mammalgia, or mastodynia, is the term used to describe a symptom characterized by any feeling of discomfort, pain, or pressure in either of the breasts. These discomforts can become as severe as an intense, fiery pain that radiates throughout the chest and renders women unable to cope with daily activities. While there are several possible reasons for feeling breast pain, the most common one is a hormonal imbalance, particularly during puberty, pregnancy, post-partum - including breastfeeding - and menopause. It is also a common symptom of premenstrual syndrome (PMS) and its more disruptive variant, premenstrual dysphoric disorder (PMDD). While often both terms are used synonymously, most of the time breast tenderness is used to refer to a milder form of mastalgia, and breast pain to a more intense or debilitating one. Breast tenderness is often described as mild to moderate discomfort and sensitivity to touch. It is a common symptom of PMS and is not usually indicative of any serious underlying causes, whereas breast pain may indicate a serious hormonal imbalance or medical condition that needs addressing. Breast pain is classified as a more intense or localized pain, which may present a sharp burning or tightness across the chest. There are three main classifications of breast pain: cyclic, non-cyclic, and extramammary. Cyclic breast pain is usually linked to the menstrual cycle, and it is characterized by a heavy, aching feeling radiating in both breasts between ovulation and menstruation. Non-cyclic breast pain is not related to the menstrual cycle. It can either be due to hormonal balance or external factors such as medication, cysts, or tumors. Extramammary breast pain is any pain that originates from outside the breast, but where the pain is felt within the breast, such as muscle pain. Keep reading to learn more about the hormonal and other causes of these three types of breast pain and breast tenderness. Although most breast tenderness only presents itself at certain points during the menstrual cycle, some women are unfortunate enough that they suffer with the affliction more frequently - possibly even every day. If this is the case for you, and you are struggling to cope with the pain, speak to your doctor about the available options. Does Mammography Cause Breast Tenderness? Mammography is the most important technique to early detect breast cancer; nonetheless, women are afraid of breast tenderness. In learning about the causes of breast pain or breast tenderness, women will better understand how to prevent and treat this troublesome condition. While the exact causes of breast pain are complex, most doctors and researchers believe hormonal changes are the primary cause of breast pain. However, other factors and medical conditions can, in more rare instances, cause breast pain or tenderness. Hormones are responsible for relaying messages between the brain and the cells and organs in the body, to control the body's processes. If hormones are not working in harmony, organs don't receive the correct signals to function adequately, so hormonal disorders can occur. Breast pain or tenderness is caused largely by the hormonal fluctuations during the transitions women go through during their reproductive life. The hormones estrogen and progesterone regulate a woman's fertility, and aid in preparing her body to ovulate, conceive, and reproduce. Both hormones influence the swelling and contractions of the milk glands in preparation for a possible pregnancy. Hence the reason why more women experience breast tenderness and breast pain during PMS and other phases of significant hormonal imbalance - puberty, menstruation, pregnancy, post-partum, and menopause. The fluctuations between the levels of estrogen and progesterone cause the milk ducts to increase or diminish in size and cause breast tenderness. If hormone levels are not regulated, women may experience a mild to severe ache in their breasts, and breast swelling will be present, as well as other psychological and physiological symptoms. PMS is a collection of disorders, such as breast tenderness, that occur prior to the menstrual cycle, caused by imbalanced hormones. Puberty is a girl's transition into womanhood, whereby her body begins to produce reproductive hormones. These hormonal factors combine with other factors, such as wearing a bra for the first time, to explain breast tenderness during puberty. Pregnancy brings with it rapid and extreme changes in the production of reproductive hormones, which can cause symptoms such as breast pain. Other factors during this stage, such as changes in breast tissue, can worsen the condition. Post-partum is a phase where hormones continue to be out-of-balance until breastfeeding ends, prolonging symptoms such as breast pain. Other factors relating to breastfeeding, such as blocked milk ducts, can help explain breast pain in post-partum. Menopause marks the point where a woman's reproductive hormones have naturally declined to the extent that she is no longer able to conceive. Breast pain in menopause can be caused by factors other than hormonal imbalance, such as hormonal replacement therapy. Hormonal imbalance is the most likely cause of breast pain throughout a woman's life. However, there are other, more serious causes of breast cancer that must also be considered. Keep reading to learn about the other causes of breast pain. Although hormonal imbalance is the most likely underlying cause of breast pain, there are other, less common causes of breast pain and breast tenderness. These include breast size, cysts, oral hormone therapies, and prior surgery. Some women are more prone to experiencing breast pain than others. Keep reading to find out the risk factors for breast pain. For some women, the likelihood of suffering from breast pain is already higher due to certain risk factors. For example, women who suffer from PMS or who have a family history of breast pain are more likely to experience this symptom at some point during reproductive life than women without these predisposing factors. As well as the possible long-term risk factors and other causes, there are certain environmental factors and behaviors that can trigger a bout of breast pain. In identifying these triggers, it may be possible to reduce the occurrence of breast pain by avoiding these culprits. 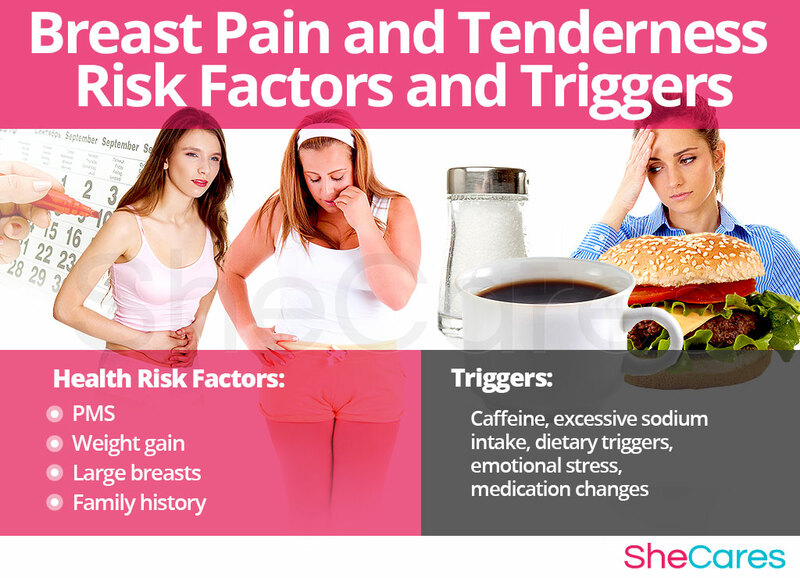 Drinking coffee, eating too much salt, and switching medication are all possible triggers of breast pain. Now that all the possible causes of breast pain have been detailed, read on to discover which breast pain signs and symptoms it is important to watch out for. Depending on the cause of the pain, some women find that instead of heated utensils, application of a cold pack or ice is more successful in alleviating severe breast pain. This can often be the case if the condition stems from a muscular problem, such as strain of the pectoralis major. As an alternative to oral pain medication, some women find that topical treatments such as anti-inflammatory creams, or heated muscle ointments are effective in relieving cyclical breast pain. There is a wide variety available to choose from, and so it is often worth experimenting with a few to find which works best for you. Breast pain symptoms can vary from woman to woman, depending on whether the pain is due to hormonal imbalance or another cause. If hormones are the cause, breast pain can be cyclic or non-cyclic (i.e., linked to the menstrual cycle or not), which influences whether the pain is intermittent or persistent. In general, breast pain caused by hormonal imbalance is bilateral (in both breasts) and generalized (felt all over). If the pain is not caused by hormonal imbalance, then it is also classed as non-cyclic; however, because it could be due to a number of causes, it is harder to classify its symptoms. These symptoms can be felt in one or across both breasts, and in a specific area or all over. Before seeking medical advice about this condition, it is important to write down the specifics of these symptoms in order that a medical professional will be able to accurately diagnose the problem. Read on to discover what signs doctors will look for when analyzing breast pain. Sensation: sharp, dull, throbbing, or radiating pain, etc. Keep reading to discover how a doctor uses these signs to diagnose the cause of breast pain. Women who experience prolonged or unexplained breast pain, or additional accompanying symptoms, should speak with a doctor to rule out rare, but more serious, causes of breast pain. A doctor will perform a physical and clinical exam, as well as asking for a medical history and a history of medication taken. If a more serious condition is suspected, a doctor may order additional tests. The main complication of breast pain has to be its impact on daily life, impeding work, home, and social life, as well as sexual activity. Left untreated, breast pain caused by hormonal imbalance could lead to a range of other hormonal disorders. However, if breast pain is caused by another condition, then more serious complications could arise; for example, ignoring an abscess or infection could result in sepsis. There are certain warning signs of these complications, including lumps, unusual discharge, or skin discoloration. Women often seek treatment to help prevent and manage their breast pain or tenderness. However, because breast pain is usually a result of hormonal fluctuations, medical intervention is not usually necessary. Instead, breast pain can be managed by adopting some self care measures. Keep reading to learn about how to prevent and manage breast pain. 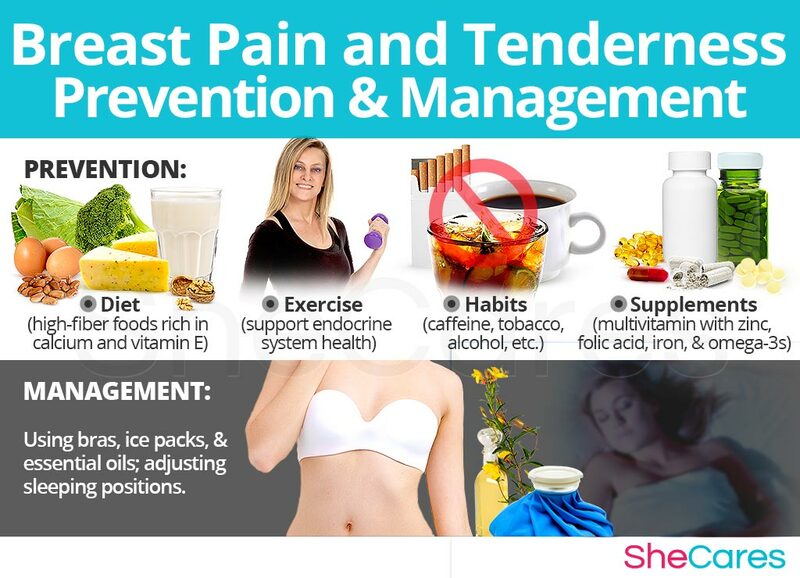 Breast pain can be caused by many factors, so there is no one all-encompassing prevention method. However, there are many preventative measures that women can take to reduce the chances of developing breast pain in the future. The best prevention measures include changes in diet, habits, and exercise plans. Women may choose to complement these measures by taking supplements that help enhance the endocrine system and, therefore, help prevent or ease symptoms of hormonal imbalance such as breast pain. These self care measures are a simple and effective way of preventing breast pain, as well as being generally good health care advice. Constant nagging breast pain can be distressing for women who experience it. Fortunately, just as there are certain factors that can trigger sudden breast pain, there are instant ways to lessen the pain. These include general tips that give women of all ages the tools they need to cope with breast tenderness or pain, including using essential oils or ice packs to reduce pain. Alternative treatments, such as acupuncture and relaxation techniques, can also be used to manage breast pain. Although these treatments do not tackle the hormonal cause behind breast pain, they can lessen the intensity of the pain over the short or medium term. However, these techniques will not work over the long term, and do not treat the root of the problem: hormonal imbalance. 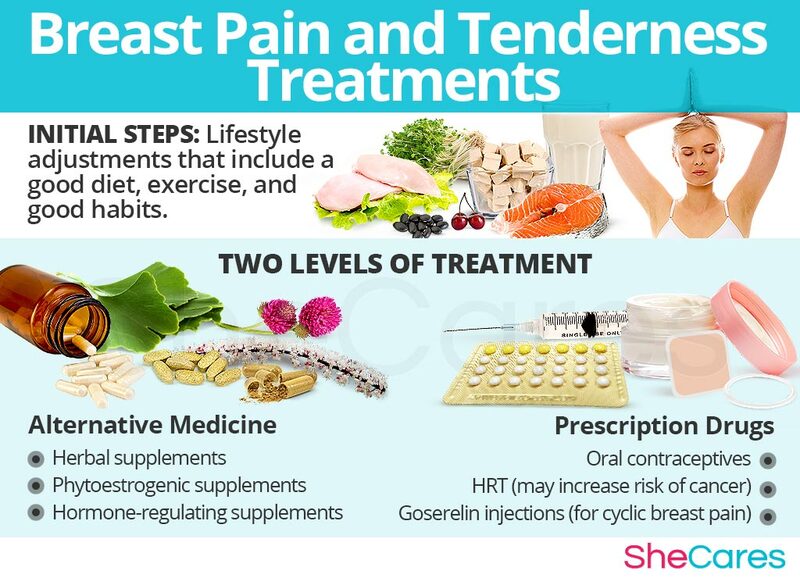 Keep reading to discover treatment options for breast pain and breast tenderness that target the hormonal cause and provide long-term relief. Breast pain is one of the many frustrating conditions that can result from hormonal imbalance, and for some women it can become severe enough that it begins to interfere with daily life. Fortunately, there are many effective treatment options available for breast pain. Three levels of approaches can be considered for treating breast pain. These are categorized as: (1) Lifestyle Changes, (2) Alternative Medicine, and (3) Pharmaceutical Options. Women are encouraged to begin with the least risky approach to breast pain treatment, lifestyle adjustments, and then proceed to the next level of care. While medical intervention is not usually necessary to treat breast pain, some women who are unable to find relief from lifestyle changes and alternative medicine may wish to consider pharmaceutical options, after properly assessing the risks associated with such a treatment. This primary level of treatment involves the least amount of risk compared to other, medical forms of treatment, though conversely it requires the highest amount of self discipline. Nevertheless, it should be the first recourse for women suffering from breast pain. Daily behaviors can have a surprising bearing on the experience of breast pain, and an overall improvement in diet, exercise, and healthy habits will help fight this and other symptoms of hormonal imbalance. More benefits can be seen when adding alternative medicine to lifestyle changes, targeting the root hormonal imbalance that causes breast pain. Alternative medicine has been shown to be an excellent way of treating breast pain related to hormonal imbalance in a safe and natural way. Alternative medicine is a great way to treat breast pain symptoms, because it is safe, effective, and avoids most of the side effects that prescription hormonal treatments, such as hormone replacement therapy, or other medications can bring. In the case of herbal supplements, there are two main types that can be used: phytoestrogenic and hormone-regulating herbal supplements. Phytoestrogenic supplements, such as black cohosh, contain estrogenic components produced by plants that complement the low estrogen hormones in a woman's body, helping alleviate breast pain. By introducing plant-based estrogens into the body, these herbs treat the underlying estrogen deficiency behind breast pain. However, these may not be effective in life stages other than menopause. Also, it is not advisable to use them for a prolonged period of time because they introduce plant-based estrogen in the body and this may decrease the body's ability to produce its own estrogen. These supplements, including Macafem nourish the endocrine system, to ensure that the right levels of hormones are being produced in the body. This results in more balanced estrogen, as well as progesterone, hormones, among others. These supplements can be considered the safest and most natural way to treat the underlying hormonal imbalance behind breast pain, and can be taken throughout a woman's life, as they support the body's natural hormone production. Additionally, there are some other types of supplements that can also alleviate breast pain, or at least make them more manageable, including vitamins and other herbal supplements. A combination of approaches is usually the most effective route to take. Healthy lifestyle changes to diet, exercise and habits, alongside alternative medicine will help regulate the endocrine system, and right the hormonal imbalance at the source of breast pain. However, for some women the symptoms will be so severe that a more drastic treatment is necessary. Pharmaceutical options are often the riskiest and most expensive of all the treatment approaches. Not all treatments are suitable for women at every life stage, so it is strongly recommended to speak to a licensed healthcare practitioner before starting any pharmaceutical treatments for breast pain. There are two main types of pharmaceutical options that can be prescribed to treat breast pain: hormone-regulating medication and other pain relieving medication.